Kurtts, S., Hibbard, K. & Levin, B. (2005). Collaborative Online Problem Solving with Preservice General Education and Special Education Teachers. 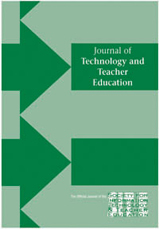 Journal of Technology and Teacher Education, 13 (3), 397-414. Norfolk, VA: Society for Information Technology & Teacher Education. Retrieved April 22, 2019 from https://www.learntechlib.org/primary/p/4822/.